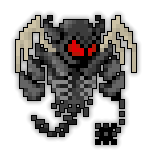 Bedlam, God of Chaos is the main boss of the Asylum of Chaos. He is found within the final chamber of the Asylum, surrounded by wandering Asylum Patients, and encircled by Guardians of Bedlam. He is extremely difficult to kill with anything but a large, varied group. Insanely (ha!) high defense, multiple spawns, healing phases, and dangerous projectiles make killing Bedlam a worthwhile challenge. Phase One: "Welcome to my Asylum…." Bedlam's activation range is LONG, and he begins Phase One by summoning Asylum Patients to his aid. By the time players reach him, he will be surrounded by a swarm of Asylum Patients who fire Unstabling shots. Bedlam will also summon three Guardians of Bedlam, which begin circling around him, firing their small, paralyzing Red Stars and short-ranged Blades. Bedlam himself fires long-range, oscillating, returning Fire Bolts at the nearest player, slow-moving three-shots of returning grey Stars that slow players for 5 seconds, and a periodic blast of shots in all directions. These shots will Quiet players for 10 seconds. Like his Guardians, he will fire short-ranged Blades at any player daring to approach. To make matters even worse, any Guardian alive will heal Bedlam at a rate of 80 HP per second. Phase Two: "You will 'ALL' die here!" When all three Guardians from Phase One are dead, Bedlam will call a few Cockroaches to his aid, and chase the nearest player. He shoots in the same pattern as Phase One, but his Quiet nova of shots is replaced by a six-shot of Purple Stars in all directions. These inflict Blind and Darkness for 5 seconds. If Bedlam drops under ???? HP, he will move to Phase Three, otherwise, after a few moments, Bedlam will revert to Phase One. Phase Three: "Bring forth… THE CHAOS!" Bedlam will call several Nurses to his location and start moving erratically. He then spawns Guardians at a slow rate, never more than three. These circle him as in Phase One. Bedlam's shot pattern is identical to that of Phase Two. When Bedlam's HP drops below ??? ?, he switches phases silently and stops moving. He summons a few Guardians that chase players instead of circling Bedlam. Bedlam will not shoot any projectiles except his six-shot of Purple Stars. He is stationary in this phase. Phase Five: "You think this is over? Hah… The madness never ends…"
If enough damage is done in Phase Four, Bedlam will simultaneously fire his Quiet nova, spawn a stream of Cockroaches, spawn a few Guardians, and chase any nearby player at high speed. He shoots in the same pattern as Phase Two.